There are lots of ways of getting involved in the work we do! 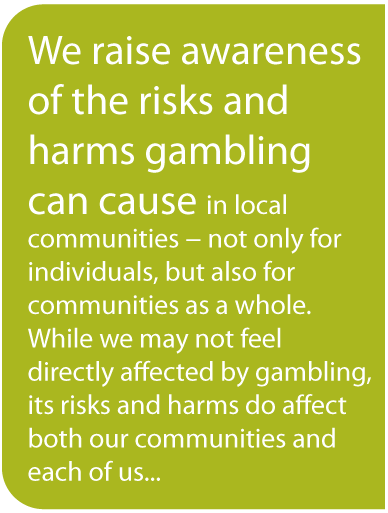 For more information about us and about gambling and associated risks, wander through our website! You will find many articles that provide a wide range of information. Also visit our Facebook page or get in touch with us. Interested in hosting a talk about gambling risk in your community? We are happy to provide you with a toolkit of resources to help support your talk. So much value comes from community members coming together to share their perspectives and learn together. Interested in becoming more seriously involved in addressing the community harms associated with gambling in Nova Scotia? As a community-based not-for profit organization, we have a volunteer board that meets monthly, and we are always open to considering new members. There are also opportunities that arise on specific projects that we become involved in from time to time. One of them might just interest you! Contact us to find out more. We are a not-for-profit that has not operated with any core funding since we began back in 2011. To donate, please visit our Donate page. The volunteer time we contribute enables us to get many things done, but some seed money to advance our work is always appreciated.